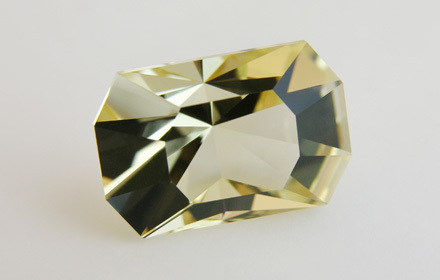 Weight: 5.55 ct; size: 13.10 | 8.76 | 8.14 mm; shape: octagon; colour: light greenish yellow; strong; clarity: eye clean; cut: excellent; treatment: none. Probably irradiated rock crystal. Very clean specimen; angles [skipping after 45 in the crown] as in ‘Opposing Corners 15’ by Robert H. Long, excellent cut by Tan Pen.